At least 24 children on their way to school and a health worker have drowned when their boat sank in northern Sudan. More than 40 children were on the boat, whose engine failed in a strong current as it crossed a 2.5km (1.6m) flooded area near the River Nile. The children, who were between the ages of seven and 16, began to panic, leaned to one side and the boat overturned, the school's headmaster told the BBC. Only two bodies have been found. Ab el-Khayr Adam Yunis, the headmaster of the Kenba High School, said the pupils usually go to school on foot, but have been using a boat for the past week due to flooding after heavy rain. "Those who died were mostly girls," he told the BBC's Focus on Africa radio programme. "One family lost five daughters, and another three families lost two children each, and two families lost three children each." The telephone network was down due to the rains, making it difficult for the headmaster to report the accident. As soon as the phones started working, they contacted all the big towns nearby - Abu Hamad, Karima and Ed-Damer - but were still waiting for help after five hours, he said. The area's residents are mostly from the Manaseer tribe. 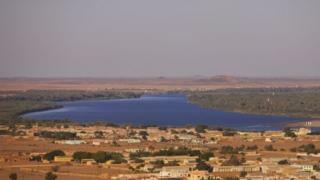 They have long raised concerns about the flooding of their land due to the construction of a controversial dam, the BBC's Mohanad Hashim reports. Sudan's annual rainy season lasts from June until late October.